Printed on red, white and blue paper. Embossed grey cardboard cover with the contours of the Netherlands flag. The language of Geert Wilders (Dutch right wing politician) is the startingpoint for Yuri Veerman’s volume of poetry called Vlakland. Within Wilders’ speeches certain tainted or ‘coloured’ words have been changed with words that have a resemblence in sound, meaning or history. The replaced words are shown in either the blue or red chapter. 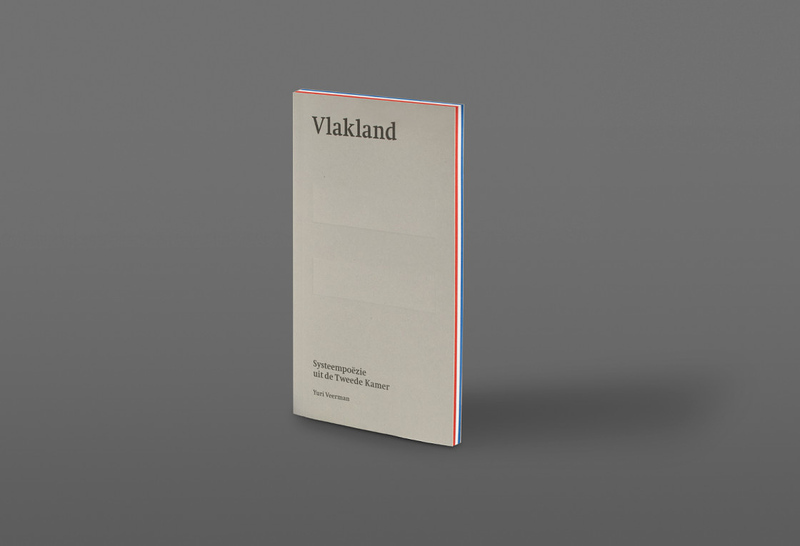 As a whole Vlakland (Flatland) shows the dualist worldview of the PVV, with a parallel world in the middle, an escape through poetry.